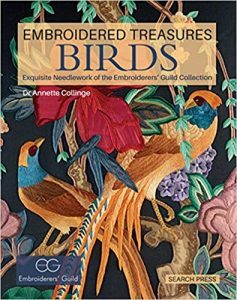 Subtitled ‘Exquisite Needlework of the Embroiderers’ Guild Collection’, this book showcases the best embroidered birds from the extensive collection. The embroideries cover a period dating from the 17th century to the present day. 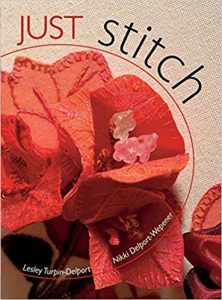 From abstract to naturalistic, the variety is wonderful and the book covers many forms of embroidery from crewelwork to contemporary. The imagination, skill and detail in portraying birds will provide much inspiration to everyone interested in this subject. 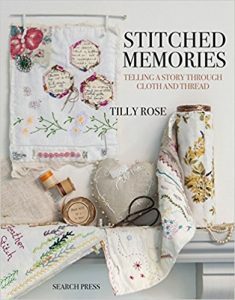 There is a brief history of the Embroiderers’ Guild followed by twelve chapters: Monochrome Embroidery; Metal Thread; Applied Materials; Machine Embroidery; Silk Embroidery; Evenweave Backgrounds; Bags; Art; Samplers; Fanciful; Birds From Many Lands and finally Stitches. A short paragraph of text opens each section, with each photographed piece of work having a title such as ‘Crewelwork Panel’ and descriptive text plus technique, date, place and size highlighted in a box. On some pieces, it also gives the maker’s name and who gifted the piece to the collection. All pieces have a EG number. I found the techniques of most interest, but this is not a book of techniques – it merely informs us of the technique used. Work as varied as rug hooking, felt applique and numerous embroidery techniques are included from all over the world. 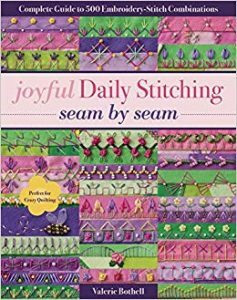 There is some overlap of the chapters, for in Chapter One on Monochrome, you will find Metal Thread and Silk Embroidery even though these have chapters of their own. Almost every manner of bird is to be found. This is a wonderful resource on how birds have been used to inspire embroidery over the centuries. Recommended.